Does anyone own a Pashley, if so tell me about it, I'm considering buying one. Excellent quality, made in England by a very good company. They have been around quite awhile. Good after sales service and friendly people to deal with. They have a nice shop as well. What more can I say? On Sheldon Brown's site there is a Mead Ranger page with an letter written by some bicycle historian and apparently Mead did have factories in the UK, this was probably before the days of merger and consolidation that lead to Phillips litte empire in Birmingham. I recall seeing a meadcatalog scan on the internet some time back, it was from the late 20s, it showed a Mead 3 speed city bike,more of a sports than roadster, with SA hubs and fancy paintwork similar to what the germans were doing at the time. I have a black Raleigh 3-speed with a serial number at the top of the seat post....8518 4Y. the 4Y is below the first number. This does not seem to corespond with the Raleigh date codes on this website, it lists 6 diget #'s with the letter P or T in the vintge of my bike which has a hub date of 1950, closed chaincase, a 1957 Dynohub up front. The bike looks early 50's ?? Any info welcome. Who can find the dynohub in this picture? "The" dyno-hub? Shouldn't you ask how many? Yup...it's in the taco'd wheel at the top right of the pile. A friend just found a vitage Raleigh....black, 1949 hub, closed chaincase, dynohub, 26" wheels and rod brakes. I know it's not a sports or a Tourist model, frame just reads "Raleigh". What model would this be ? Nice find but neither a Sports or a Tourist... she's a Dawn Tourist roadster. Should have a brazed backstay unlike the the bolted on backstay of the Tourist and, of course, the smaller 26" wheels with Westrick rims not Westwood. Pre-war (and up to '46) Dawns had bolted on backstays and Westwood 26" rims. There were also Dawn Superbes which were Raleigh Green, had dynofour or dynothree hubs and the battery pack for lighting, fork lock etc. etc. Super bike and well worth restoring and riding. That's ok - I once recieved a letter addressed to "Hurt Haminer." I resent for being called hurt, but I can't say that I'm not a ham. By the way, I'll be on the lookout for those 5 speed models as well. As my luck is running now, I don't think I'll be able to find an S-A Endrick on anything else. Kurt, hold on! Whenever my luck is running out, it seems I always come up with whatever it is for which I had been searching. Thats when you find it. My memory is getting a little blurry, but I think I can still hear the Grateful Dead singing "Once in awhile you get shown the light in the strangest of places if you look at it right!" I have the Dead playing on the CD player right now! 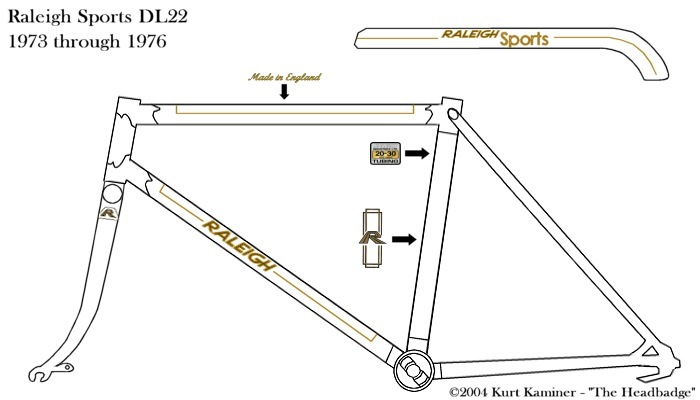 Since the Raleigh Sports chart is chugging along, and there's no reason to discuss the Indian Roadster parts anymore, I thought I'd open up another can of worms with this post (and hopefully stop over-injecting humor into my posts a-la Sheldon Brown). I was recently so fortunate to be given a Raleigh Grand Prix last weekend. It appears to be a 1973 (has "73" stamped in the headtube lug), with the common maroon/black paint scheme. It's pretty much a bucket of rust, and needs to go in for sandblasting. Now, as if I didn't have enough projects, the idea of a 'retro' 2005 Raleigh has always appealed to me, so much so, that I made some sketches of how I would design an '05 Sports or Clubman. But after looking over the Grand Prix frame, it didn't seem to say "Clubman," not with that 20-30 steel frame or wide rear triangle for derailer gears. Neither did that wheelbase scream "Sports." However, after giving it a second look, it appears to be the perfect frame to use for a 2005 Blue Streak. I plan to design a set of slightly modernized Blue Streak decals/transfers for the '05 Blue Streak Project, however, from my research in the past, I have only found the B&W scans from the 1962 Raleigh catelouge, and the one photo of Jeff Groman's Blue Steak at Classicrendezvous.com. Being that the Blue Streak is such a rare bird, would it be possible that I may find photos of the original transfers, or should I count my blessings that I even found the two photos that I previously located? I've long thought about doing something similar, using a Raleigh 531 frame, painted black, fake blumels - SKS fenders painted white or Honjo steel fenders, Lauterwasser handlebars or moustache, a bike builder said he would try making me some Lauterwassers, we'll see how that works out - either type painted black to match the frame, AW hub, dynohub. not a copy of a specific model but a nice new 1930s clubbike. Now that I have a 51 Clubman I probably won't bother with that. Me, I'm itchin for an old Club Bike so bad it hurts. I've decided that some part of my life-living philosophy involves hub geared sport racing bikes, preferably old. Since I am lacking in the Vintage Clubman department, but not necessarily so in the junk parts department, I've been giving a lot of thought to building a modern club bike, pretty much just to satisfy my overpowering compulsions on the subject. I don't have any real info to add to this discussion, but pass the koolaid if you have any more. I'm hooked! I have a Hercules clubbike, I'd sell, late 30s or early post-war? Black with dark red headtube and brass headbadge The hub is damaged BW flip flop hub, wing nuts, SA wingnuts in the front and Benelux in the back, odd headset with no pressed crown race on top, it's a bit small though, around 21" frame, unfortunately no Lauterwassers, but the stem is nice in the sense that it looks nice but doesn't seem to be compatable with anything other than the upright bars on the bike, the person who owned it before me used steel wool on the rims (26 *1 1/4), so they have some markings noticable up close but are in good shape, the wheels were probably rebuilt some time in the past. Hercules side pull brakes, original fenders. paint it pretty good shape, interesting transfers on the frame, some Norman looking warrior on the seat tube. In the 1938 catalogue, the bike is shown having some type of moustache bars, not quite lauterwassers, everything else seems to match the bike in the catalogue. A very, very interesting discovery. Maybe I'm wrong, and someone has posted this link before. But maybe not. This place has brand new Raleigh and Phillips Roadster mudguards, Westwood, Westrick and Endrick rims, Raleigh and Humber light brackets, and TWENTY-SIX T.P.I. BOTTOM BRACKET CUPS. They also have Heron chainwheels (with cotters) and Pheonix chainwheels. Have included the link to the main page - click on Producs and feast your eyes. The "SLR" appears to be a direct copy of the Sports. Have not contacted them about minimum orders, etc. Kurt... about two years ago I investigated ordering similar parts from India from Mangla Industries. There are at least 10 of these firms in India. And I swear they are made in the same factory.. compare the addresses!! They are not really keen on supplying anything like the quantities I suspect you are pondering. Brake pads for example were quoted at an absurdly low rate.. if you ordered 12 gross! And, not to bring up this topic again folks, but Indian roadsers are rubbish. Just junk. Sure they look traditional. And shiny. And they are cheap. Thus is summed up their virtues. The machining of the essential fitments (bottom brackets, headsets) is abysmal. A Jr. High School metalshop could do better. So could Iron Age Man in a cave. The chrome plating is so thin you could read your Times of India through it. And most of the rims are 36-hold not the 32/40 we need. Cycles of Yesteryear (UK) redoes British made roadsters with a lot of these Indian knock-off parts. Eeech. They sent back a Lenton Sports frame to me with "new" Indian headset. Could tell it was phony a mile away. Not even finished.. you could shave with the sharp edges on it. And peel the chrome off the nuts with your fingernail. Thank goodness they included the original British fitments. There is still an abundance of REAL British made parts for these machines. Look towards England, Australia and here for the real thing. You'll go through a dozen of the Indian made parts before you wear out one of the British made ones in your lifetime. Brakeshoes sure... get 'em from India (but Fibrax makes them in England.. check out their website) but when it comes to the running gear, forgetaboutit. Buy British! Thank you very much for the information Peter! I've been slowly compiling a new Raleigh Sports-specific year identification system for "The Headbadge." I've been putting the information together with bits and pieces of information picked up (and from observing quite a few Sports), and of course from the very helpful chart on Sheldon Brown's site. I've just about finished the equipment identification chart, which is based quite a bit on the Raleigh Timeline from Sheldon's site. There are still some sections in the chart that I am not too sure about, and I need some help to get the bugs out. If you fellows could do me a favor and check the chart for errors, I would appriciate it greatly. A paint-scheme ID method and some other interesting methods will be added to the page after I finalize the chart. Finally... someone is doing some detailed, possibly comprehensive on THE British roadster.. i.e. the Raleigh Sports! I have a pretty comprehensive collection of Raleigh catalogues from 1935- onwards and would be glad to provide specific year-to-year specs. One thought: would this not be best incorporated in some manner with the already estalished "Retro Raleighs" site? See my feature on the Raleigh Clubmans in this to get an idea how a separate and detailed treatise on the Sports might be worked into this handy site? Of course, Sheldon Brown needs to do a lot of work here and have the bandwith. But you two might discuss the possibilities. He also has material for the Lenton series which I gave him some time ago. And I'd like to do something on the RRA. But well done, sir! Thanks for taking the initiative here. Peter, there's nothing better as a resource then the old Raleigh brochures, and unfortunately, there are precious little of them online. All but a few of Sheldon's omit the more conventional (i.e., non-roadbike) models (including the Sports) entirely. From what I have seen of his home page, Sheldon has been very busy recently - I would not know if he would be up to getting Retro Raleighs back up and running. Neither am I certain that he would be receptive to the idea on concentrating Raleigh's older, more obscure models. Even though they are not full-sized cycles, I do want write up a similar identification system for the Raleigh Colt and Space Rider, as well as the full-size Sprite and Tourist. Quite interesting to note that the Tourist, probably second to the Sports (or vice-versa) in popularity, that it, like the Sports, is in sore need of documentation. Contact me at cudak888@aol.com and maybe we can arrange something. P.S. : As well as the 1974 catelouge, I am very intrested in the examples from 1971, 1972 and 1973, as I believe that in 1973, the Sports aquired the 36/36 spoke arrangement, and self-adjusting brakes, among other things. By the way, I would like to do a section on the Lenton and RRA sometime too. Right now though, I'm going to concentrate on perfecting and completing the section on the Sports. After I finish the chart, the section will also feature a year-by-year diagram of the paint schemes, features, etc., available for that particular year. For your enjoyment, below is a picture of what the paint diagrams should ultimately look like...more to come on this later on! Any ideas on how old it is? I guess you're trying to make us guess? Whats written on the SA hub? That will provide more clues than anything else. Frame date codes are hard to reference for many marques. And what makes it a two speed? SA top tube shifters are often mistaken as Low-Neutral-High when it is Low-Normal-High. If it's a true T-series 2 speed hub then you've got a gem...likely 1930's. I responded to your post on the bikeforums so in case you read this first http://www.sheldonbrown.com/sturmey-archer.html this shows the two speed hubs if it is indeed a two speed. I've seen quite a few top tube shifters sold as two speed shifters, the N really means normal 2nd gear not neutral. On the other site you wrote that it has rod brakes, which would make a 2 speed hub a bit odd as those were used on sporty bikes, though it might not be the original hub. I'm curious, what type of headset does it have? I have a 1930s Hercules that does not have a pressed crown race on top. I think the best would be for me to take a couple of close-up pics of the bike and post them on the forum... this might make it easier to determine the age. Watch this space! The rear hub just says Sturmey-Archer. Can't see any numbers on it... maybe it isn't the original? Where exactly on the rear hub is the "two-digit date code" supposed to be? I would be really interested to determine this bikes age. I bought it in a sorry state and have enjoyed working on it. Just checked the rear hub again and the link suggested by James (thanks). It has a code on it which reads AW. This makes it a common 3-speed hub. No date code on it though... and, as suggested, it is possibe that it isn't the correct hub. I believe the AW was introduced in the late 30's. The archives reveal that it has been surmised that the early war years (40-41) were undated. How's that for hard facts! The N on the shifter did stand for normal as opposed to neutral. 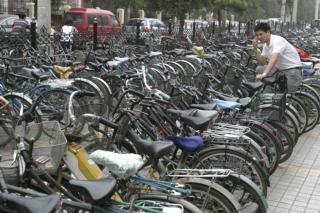 It appears that your bike is original. It's a keeper! Thanks Warren! This news really makes my day! I thought the bike was old but was not prepared for 1940/41! I am keen to rush out and look for more old gems immediately! What a cool hobby! It certainly is a sickness- once the bug gets in that's all she wrote. Within a mattetr of months you find that you have collected more bikes and parts than you know what to do with. Though it's the only virus I've been glad to have caught! Wanted to know what year was the last for the closed chaincase on the sports model sold in the U.S. Also, what year was the change made from a headlite with black paint to one with silver paint? I believe the chaincase braze-ons were finally omitted in 1961, if Sheldon's page is correct, and the last year for closed chaincases in the U.S. was 1953. I'm not sure if you mean the DL21 Sports or DL22 Sports/Sports Light Roadster when you ask when the color changed on the headlight, so I can't answer this, sorry. I sure would like to know myself! My brothers 1962 sports, which he purchased new, has a full chaincase and dyno hub. In response to your question about the headlight, I believe that black enamel was replaced by silver paint and/or chrome sometime during the 1950s. The black enamel is a holdover from wartime and the pre-WWII era. I personally love the black enamelled parts. I recently obtained a lot of 9 (!) WWII-era Ever Ready headlamps with black enameled bodies and white-painted insides in place of a chromed reflector. These are going on my cycles from c. 1930s to 1950s. I am interested in selling some of these, by the way, as I don't have NINE cycles on which to display them. When I get time, I will be doing the PIFCO lamp conversion trick to get these NOS (and boxed) beauties up and running. The silver-grey coloured shell for the dynonub lamps has more to do wtih the colour finishes of the models than a special year. Simply put, if your Raleigh (Humber, Rudge etc), be it a Clubman, Lenton, Sports Light Roadster et. al. had a coloured frame, the lamp was usually painted silver. This dates to c. 1948-49 onwards. I think I am correct that all of the enamelled headlamp shells, including the later "streamlined" shape which dates to the mid 50s, came in either silver or black or indeed chrome. So not a case so much of the black suddenly being superceded; the silver was just more popular especially in the USA. Trick to recreate the finish of the silver headlamp shell. Spray with silver rattle can enamel. Then (and this is the essential bit): overspray when dry with a clear protective gloss. This gives the silver that nice warm grey tone and the essential gloss instead of that yucky metallic furry finish. There's is nothing worse than plain silver metallic spray paint on a bike... eeechh!!! Use a clear topcoat and it looks marvelous! Daily Pic from the Gazzetta; to enlarge pix I make it my wallpaper; though it's not clear, it looks like Old Roads Heaven. Too many riser handlebars, not enough North Roads! http://www.world-of-bicycles.com/india/photo4.htm lots of photos of roadsters on this site, to be found in photos from asia, holland and belgium. #1: One Raleigh handlebar and stem. Handlebar MUST be near perfect with NO scrapes, NO pitting. Must have abselutely no under-chrome rust. Surface rust is ok, but it must clean off with no pitting residue. Willing to buy just stem or handlebar if nessesary. #2: One pair of Raleigh self-adjusting brake calipers. Must have no rust, and levers must not be bent. #3: One Sturmey-Archer 26 & 1-3/8" 40 hole Endrick rim - Must be reasonably straight - enough that it can be trued when spoked. Light or semi-moderate surface rust is ok, as long as there's good chrome under the rust. Light pitting is ok. No internal rust, please! P.S. : I know there's confusion about the Endrick, Westrick, and Westwood rim names - attached is a pic of the Endrick rim, and a cross section showing it's pattern. 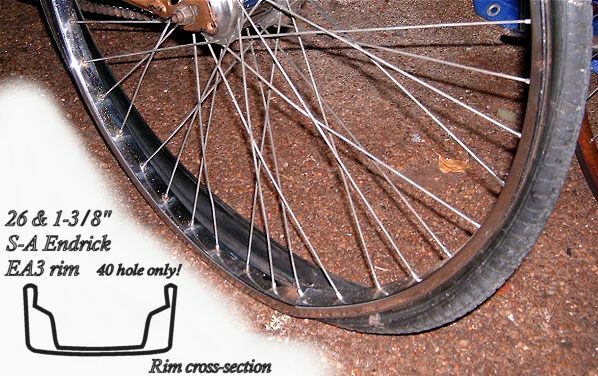 The Endrick does NOT have a raised center section to protect spokes from rod brakes. And yes, the rim IS bent at the bottom. Anyone who may have these parts can contact me at: cudak888@aol.com. Please let me know condition and pricing. Will not respond to "Make me an offer!" emails! What a pity! I had one of those Endrick rims that I was giving away - but no one responded, so this rim & two Raleigh Pattern rims (as well) went to a great NYS landfill when I moved. And they were like new too - shiny & straight. That's a real shame Brian...hopefully someone grabbed them up. You wouldn't happen to have anything else you are temped to throw out...would you? Sam, do you mean that these 40 hole Endricks were used with 5 speed derailers on AMFs? I'm pretty sure the 40 hole Endrick was standard on the AMF Hercules 3 speeds, but I never heard anything about a 5 speed until now.